Anumantha Kanthasamy has been working to understand the complex mechanisms of Parkinson’s disease for more than a decade and thinks he has discovered a critical pathway that might lead to a cure. IOWA STATE (US)—Researchers have found an essential key that could lead to new treatments and possibly a cure for Parkinson’s disease. They have identified the protein that kills dopamine-producing cells in the brain—and a way to disable it. Parkinson’s disease sufferers lack a sufficient amount of dopamine. 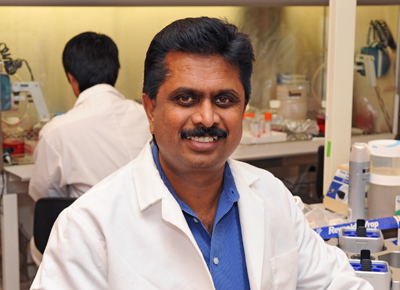 Anumantha Kanthasamy, a distinguished professor of biomedical sciences and W. Eugene and Linda R. Lloyd Endowed Chair in Neurotoxicology at Iowa State University, discovered that a novel protein—known as protein kinase-C—destroys dopamine-producing cells. Now, Kanthasamy’s group is looking for additional compounds that also can serve to neutralize protein kinase-C. By identifying more compounds that perform the function of neutralizing kinase-C, researchers are more likely to locate one that works well and has few side effects. “Once we find the compound, we need to make sure it’s safe. If everything goes well, it could take about 10 years, and then we might be able to see something that will truly make a difference in the lives of people with this disorder,” says Kanthasamy. Parkinson’s disease strikes around 50,000 people each year, and there are approximately 1 million people with the disease. Parkinson’s sufferers include actor Michael J. Fox and former boxing champion Muhammad Ali. As people grow older, the cells that produce dopamine naturally die, causing dopamine levels to fall gradually over time. When the levels continue to drop below 60 to 70 percent, the person will start to have Parkinson’s disease symptoms, according to Kanthasamy. Eliminating the symptoms of Parkinson’s disease doesn’t require people to be restored to 100 percent of previous dopamine levels, but only to a fraction of that. “If you can bring dopamine up to the 40-50 percent level, you’ll see a functioning, normal person,” he adds. Currently, there is no cure for Parkinson’s and available therapies only treat the symptoms. Major contributing factors for getting Parkinson’s disease include prolonged exposure to metals or pesticides and other environmental chemicals, according to Kanthasamy. Because the disease typically affects people over the age of 50, the National Institutes of Health anticipates the incidence of Parkinson’s will increase as the nation’s population ages. The research was supported by a Grow Iowa Values Fund grant and the National Institutes of Health.